Much as I love to wax poetic about bangles, vintage skirts, and seasonal palettes, every once in a while a wave breaks over pop culture that's just too huge not to solicit some kind of reality check. When I sat down to plan yesterday's post, the news of Robin William's death still hung close to my chest, pressing smoglike against my heart and lungs. I knew a reflection would be a necessary component of my personal mourning process, and I also knew I'd need day's distance before beginning it. This man, this creature of genius, exploded into my life as he had for many others of my generation: as a bright blue, scene-stealing, whirlwind of a genie. You could sense his magic not just in the lamp he burst from or his breakneck shape-shifting powers, but also in the multidimensional quality of his voice: delight one moment, then manic lunacy, always decelerating for a moment of genuine tenderness. I remember asking my parents what was "so funny" about his lines and impressions, wanting to be a part of the inside joke this character shared with his more mature audience members. My dad would just shake his head, chuckle, and say: "Robin Williams." 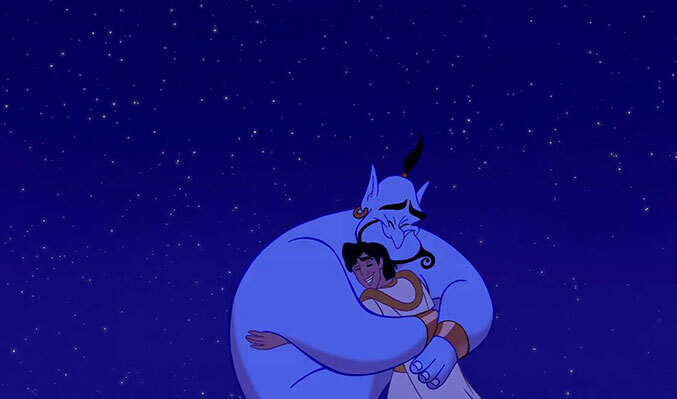 To say Robin Williams was funny would be an incredible understatement. Not simply because there are far better words to encompass his comic capacity (hysterical, side-splitting, exceptional, genius... to name a few), but because it overlooks the other remarkable qualities he brought to his acting. My mind flutters to a final scene in Jumanji, when I witnessed firsthand what fear looks like, and what triumphs may reward us when we face that fear head-on. In my countless viewings of Mrs. Doubtfire, I recognized (and began to understand) the heartbreak of my friends who were dealing with divorce. 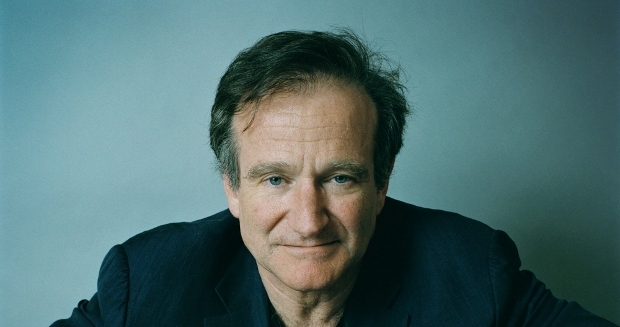 Patch Adams and Bicentennial Man awakened a bittersweet understanding of loss and death at the apex of my childhood. Even in those early days, I recall being shaken by the sincerity of emotion Williams brought to the screen. My fascination with this talent only increased as the movies I watched became weightier: Dead Poet's Society, Good Will Hunting, What Dreams May Come. It was comforting to have him there, seeing me through the difficult subject matters of war, classism, abuse, and, yes, suicide. In the wake of his death, I know a lot of folks are asking the usual questions -- How could such a successful person want to end their life? What thoughts were going through his head as he made the choice? Was he aware of how beloved he was? -- as well as more important ones -- How does this reflect our country's disregard for mental health? What can we do to lessen the chances of this happening in the future? Myself, I keep wondering why. Not why he did it, but why I feel it so deeply. Why I've spent the last 30-some hours not merely considering but truly mourning this man I knew only as a character on a screen. What am I to learn from it? Where do I go next? Maybe these are selfish inquiries. Maybe it's enough to say the man was a fellow human and worthy of being mourned for that reason alone. But I feel something bigger in this. I'm not sure what it is, but within it lies the reason for my own reluctance to get out of bed this morning, the unexpected & uncontrollable wave of tears that interrupted my morning commute, and this enduring, compulsive need to digest everything the internet has to offer in the way of memorial. At the end of the day, this is a loss of innocence for my generation. It's a reminder to acknowledge all of our emotions, impulses, and perspectives -- not just the ones that are acceptable or logical or politically correct. Williams was a man who shook up the norm. He let his wit off the leash. He offered truth to a world that so often relies on artifice for entertainment. With a lionhearted vulnerability, he allowed himself to feel deeply, and in doing so, he revealed both the exquisite beauty and the terrible tragedy that such an allowance enables. And laughter. Above all things, laughter.